If you are a follower of the Oracle of Omaha, then you'll love these three stocks that are either in his portfolio or like stocks that he owns. Warren Buffett's investment results have garnered him a great deal of fame and a huge fan base. The annual Berkshire Hathaway meeting is more of a pilgrimage to see Buffett and partner Charlie Munger in person than it is about learning the ins and outs of the conglomerate's recent financial results. But you don't have to go all the way to Omaha, Nebraska, to figure out what Buffett is doing and how you can emulate his approach. Seritage Growth Properties (NYSE:SRG), McCormick & Company (NYSE:MKC), and U.S. Bancorp (NYSE:USB) are stocks that are just right for Buffett fans, according to these three Motley Fool contributors. Reuben Gregg Brewer (Seritage Growth Properties): Warren Buffett owns 5.7% of Seritage, a retail-focused real estate investment trust (REIT). That's a direct investment, too, so the famed investor is playing with his own money here. That said, with a tiny 1.9% dividend yield, this REIT isn't a play on income -- it's about rental growth. In the second quarter, Seritage was able to replace old tenants paying around $4.30 a square foot with new ones paying roughly $14. That's a massive jump that speaks to the immense opportunity here. But here's the twist: Seritage was created in 2015 to own Sears Holdings retail properties so the troubled retailer could raise much-needed cash. Seritage has done a great job of shifting its tenant mix away from Sears and Kmart stores as those retailers shutter locations, but Sears Holdings still accounts for 43% of its portfolio. That's both an opportunity and a risk, since there's no sign of a turnaround at Sears Holdings. A bankruptcy could leave Seritage with a lot of empty buildings all at once. The trend, however, has been far more orderly so far. And even in a worst-case scenario, the opportunity to raise below-market rents to market levels is huge. Which is exactly why Buffett bought into Seritage shortly after it went public. Add in the fact that Berkshire Hathaway recently provided $2 billion in financing to the REIT, and even a worst-case scenario doesn't look like it will derail the potential here. If you like Buffett, you'll probably like the risk/reward situation at Seritage. Demitri Kalogeropoulos (McCormick): Buffett has a soft spot for consumer-focused companies that pair strong brands with market-leading pricing power. Spice giant McCormick fits that mold perfectly. The company recently posted a 19% sales spike powered by an acquisition that added the powerhouse condiment brands of French's and Frank's to its already stellar portfolio of spices and flavorings. And, in contrast to most packaged-foods specialists, McCormick's profitability is rising right now, with gross margin jumping 3.4 percentage points last quarter to pass 43% of sales. 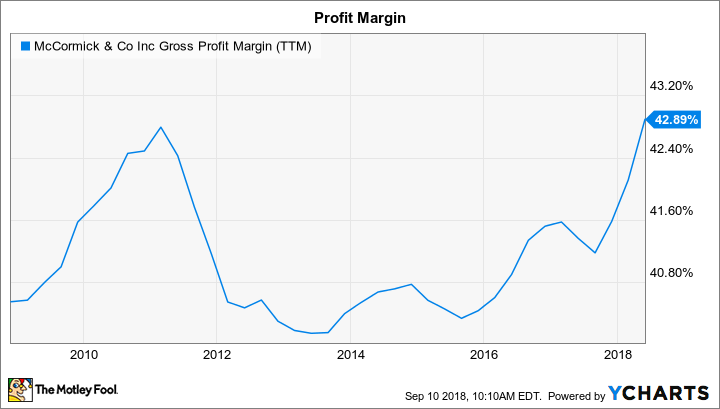 MKC gross profit margin data by YCharts. TTM = trailing 12 months. The flavorings specialist is expecting to grow earnings from 14% to 16% this year despite increased marketing spending in support of its brands. That profit outlook also includes aggressive plans to pay down the $4 billion of debt that management took on when it acquired the Reckitt Benckiser condiment portfolio. McCormick's strong cash flow and leading position in the industry make it possible for executives to make these investments while still delivering robust overall returns to shareholders. These assets also help support a premium valuation for the stock that should persist as long as McCormick continues accumulating market share in its attractive industry niche. Jordan Wathen (U.S. Bancorp): Buffett's extraordinary investment record is the byproduct of his skill investing in just a handful of industries, and banking is one industry where he has reaped exceptional returns for his investors. U.S. Bancorp is part of Berkshire's portfolio, and has been for a long time. That's because this bank stands out for having below-average loan losses, exceptionally low operating costs, and valuable fee-based businesses that help keep the lights on even when loan losses turn for the worse. About 45% of U.S. Bancorp's net revenue comes from non-interest sources -- things like card processing, mortgage banking, and investment management services. This fee-based income covers the majority (roughly 76%) of U.S. Bancorp's operating costs, which means it doesn't have to take outsize risk in its loan portfolio to generate attractive returns for investors. Its conservative underwriting culture is best demonstrated by its performance during the financial crisis, when net charge-offs peaked at 2.17% of total loans, despite heavy concentration in credit cards and home equity loans, which sent other banks spiraling toward bankruptcy court. In banking, it often pays to be "boring." The banks that survive and thrive through multiple economic cycles have low-cost operations, high-quality loan portfolios, and fee-based sources of revenue that provide steady profits in all economic conditions. At about 16 times consensus estimates for 2018, U.S. Bancorp shares offer a fair value as a bank you can confidently buy and hold for the long haul. At least one of these stocks (if not all of them) is worth further research for fans of Warren Buffett. Seritage is an aggressive play on a fundamentally strong business making an important shift away from Sears Holdings stores. McCormick has the kind of business that Buffett likes and has been doing well while peers have struggled. And U.S. Bancorp is a boring bank that can underpin a portfolio with steady returns -- no matter what the market throws at it.